Before you work through this walkthrough, you should make sure you’ve read (or at least understood) the contents of the beginner’s tutorial. In the beginner’s tutorial, we showed how ProjectTemplate automatically loads data files from the data and cache directories. If you’re working with plain text files or any of the supported binary file formats, this automatic data loading should work out of the box without any effort on your part. But if you have to retrieve data sets from more complex data sources, ProjectTemplate has advanced features that will let you set up ad hoc autoloading. 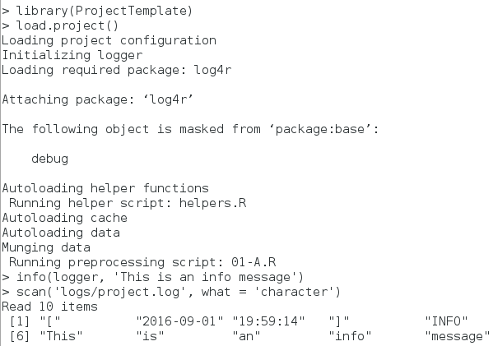 In the rest of this document, we’ll talk about working with SQL databases, remote resources available over HTTP and FTP, large data files stored on external drives and R files that contain code that generates data at runtime. Let’s start by working with a SQLite database. We’ll use a database from the Analytics X competition in which contestants were trying to predict crimes that took place in Philadelphia. You can download the database file here. To save on bandwidth, we’ve compressed the database, so you should uncompress it before going through the rest of this tutorial. For most users, this automatic loading procedure is probably enough. But if you need more fine-grained control, you can use the .sql ad hoc file type to load specific tables from a SQLite database. You can also specify an exact SQL query to run against the database. We’ll go through all three cases below. Sometimes you want to work with more interesting sorts of data than a typical text file. ProjectTemplate now has basic support for loading media files into R. To load an MP3 audio file into an R object for analysis, simply place the .mp3 file in the data directory. The tuneR package will be automatically loaded by ProjectTemplate and the MP3 file will be read into an R object in the global environment. Similarly, if you want to load a PPM image file, just place the .ppm file into the data directory. ProjectTemplate will then use the pixmap package to load the image file into an R object in the global environment. ProjectTemplate has been designed to make it easier to unit test the functions you’ve written for your analysis. 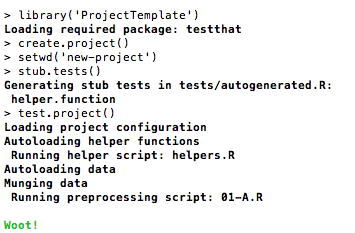 To get started, you can call stub.tests(), which will generate a file at tests/autogenerated.R filled with sample tests for every one of the functions you defined inside of the lib directory. You should edit these tests, as they are expected to fail by default. After editing your tests, you can call test.project() to run all of the unit tests in the tests directory. The data.table package allows you to create a variant of the typical R data frame that provides indices. Indices make locating and selecting subsets of your data much faster than the typical vector scan that R uses when working with data frames. To automatically convert all of the data frames loaded from the data directory into data.tables, change the configuration option in config/global.dcf to data_tables: on. After that, you can check for tables by calling the tables() function. Sometimes files in the data/ directory should be ignored while loading the data. A notorious example in Windows™ is the creation of Thumbs.db a file containing thumbnail previews of the files in the folder. 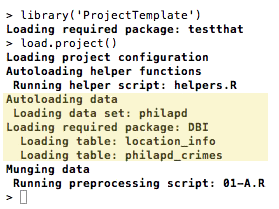 By default .db files are imported as SQLite databases, which fails for Thumbs.db. Literal filename: Simply specify a filename, like Thumbs.db in the default settings, and it will be excluded. If you have recursive_loading enabled make sure you add the path to the file, relative to the data/ directory. So to ignore the file test.csv in the folder data/more-data/ you add more-data/test.csv to the list. A wildcard * is allowed in literal filenames to match multiple characters. So to ignore all .csv files under the data/ directory and subdirectories you add *.csv, and to ignore them only in the folder data/test-data/ you change the pattern to test-data/*.csv. Literal directory: Specify the directoryname relative to the data/ directory, and add a trailing /. To ignore the directory data/raw/ entirely add the the pattern raw/. The * wildcard is allowed in directory patterns as well. Regular expression: For advanced patterns it is possible to use regular expressions. Regular expressions have to inserted between two slashes. Expressions are evaluated with option perl = TRUE. You should not escape backslashes in global.dcf, unless a literal \ is meant. The filenames are evaluated individually so it is not possible to use forward or backward references to other files in the same directory. This can for example be used to exclude a filename from a the data/ directory and all subdirectories. To ignore help.txt in all folders use the pattern /^(.*/)?help\\.txt$/. Explaining all possibilities of regular expressions is too much for this page, see ‘Perl-like Regular Expressions’ under ?base::regex for more information. When encoutering unexpected results from load.project in the load data phase it can be useful to have some insight in what files are found by load.project and which reader is used to import the data. For this purpose the list.data function returns a list of all files, with metadata on how the variable will be called, whether it is in the cache, whether it matches a data_ignore pattern, and what reader will be used. 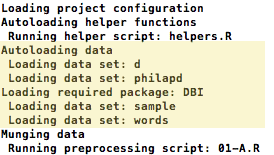 list.data doesn’t actually read the files so it is much quicker than a call to load.project. Note that variables in the cache are matched to filenames in data/ recursively, after which only files are displayed by list.data that match the recursive_loading setting in config/global.dcf. This ensures that ignored variables from a nested folder in data/ don’t get loaded from cache. As a consequence, some variables visible by list.files('cache') might not show up in the output of list.data if recursive_loading is set to FALSE.